As a Range Officer you have a duty to keep those coming to your range for recreation or training safe from themselves, keep the event under control, make sure range rules are being followed, and ultimately ensure that no one is endangering the safety of others. The idea that "everyone is a range officer" is incorrect. The fact that everyone is responsible for their own actions, however is true. The duties of a Range Officer are different than the responsibilities of those attending the training event. What is a Range Safety Officer? A Range Officer is someone who has a sufficient knowledge of firearms, the different action types, and how they work. This, coupled with an understanding of the range rules and safety procedures creates a knowledge base to provide a safe environment for training. As an Instructor, it's important that you be a good Range Officer. Being an Instructor doesn't make you a Range Officer, however good Instructors are always looking for an edge to make them better. Being a good Instructor means being a good Range Officer as well. 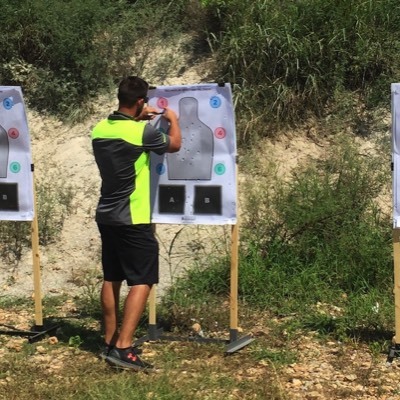 With all that being said, what are some things to watch for and things that I do to make sure my range, or the range I'm working, is safe and my students/clients are safe. Student concentration is impossible if the client feels that the environment is unsafe. The first thing that I look for after the safety briefing are clothing items. Are shirts tucked in, shoe laces tied, holsters in good repair, duty belts in good shape? Layers of clothing or loose fitting clothing may be comfortable depending on the weather, however those items can cause significant problems. More on that later. I then look for eye and ear protection. Ear protection is a self correcting problem after the first shot rings out, eye protection however is a must. You have all kinds of powder and empty brass flying through the air and you don't want to catch any of that in the eye. So now we are on the line getting ready to shoot, I make sure everybody is oriented towards the target, guns are in the holster, eyes, and ears are in place. The call has been made and the process of getting your firearm out of the holster is in play. I am looking for a draw that starts with a good strong hand grip that brings the elbow up high. You want to draw straight up and out of the holster. NO guns pointed to the rear of the range. The elbow comes up high, finger off of the trigger and the gun is oriented towards the target by dropping the elbow. As that happens and the pistol moved out to full extension the grip is completed by the offhand. I’m looking there to make sure the strong hand is high on the grip of the gun and the thumbs are layered, no thumb on the back of the gun, also a self correcting problem, but is avoidable with proper hand placement. So the string of fire is completed and guns are coming back to the holster. I have to remember the layers of clothing (especially in cold weather), or loose fit clothing, the top of the holster needs to be clear, and if the firearm has a manual safety I want to see it taken off on extension and back on upon return from extension. So another call is made and say there is a reload that needs to take place, at this time I'm looking to make sure guns are pointed in a safe direction. UP IS NOT SAFE! So once again fingers are off triggers, magazine falls free, new magazine is inserted, and either reengage or assess and reholster. Once again making sure the top of the holster is clear from all obstructions. If it is a carbine class, I want to see the same kind of things. Sling position, muzzle direction on reload, clothing, and the 4 points of contact practiced correctly and the safely used properly. During my time as a RSO I've seen several different shooting styles or ready positions. With handguns, I prefer and tend to push my students/clients towards the high compressed ready position. From a range safety perspective the student/client has complete control of the firearm, it’s parallel to the ground, and perpendicular to their body. Ultimately the safest, most easily controlled place except for the holster. Next let's say we have empty magazines on the ground and it’s time to collect them and go to back of line to reload them. All firearms need to be holstered before anyone picks up their magazines. We can't have anyone leaning down to retrieve magazines during a string of fire or a potential string of fire. Now we have had a successful day of shooting and fun, we're done for the day. Everyone who has a firearm comes up to the line and gets shoulder to shoulder, drops their magazine, locks the slide to the rear, and shows their neighbor that the chamber is empty and the magazine well is empty. Thank everyone for participating and proceed to clean up and close the range according to the range SOPs after the students/clients/attendees have left.